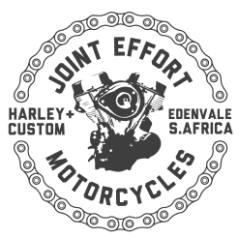 Joint Effort is the oldest independent Custom Motorcycle sales and service shop in South Africa, situated in Edenvale, Robin Da Silva and Joint Effort have been open and operating for 29yrs this year (2018). With a wide range of spares, a full workshop and a sales showroom, Joint Effort is a one stop shop. and do customizing on any bike. Joint Effort have been around since 1990, we have a dedicated workshop team that specializes in high performance modifications and all round customizing. Regular imports from USA and Europe arrive within 10 working days. Our bikes and services are price worthy, because we have little overheads. All work is done and supervised by Robin Da Silva, the shop owner. He's a professional who has been dealing with specialized bikes for over 25 years. He knows about your needs, and special attention is given to each and every client. There also is a Dyno to fine tune your baby.